Scholars consider Azerbaijan to include “the land populated today by the Azeri Turks, the people who inhabit the region stretching from the northern slopes of the Caucuses Mountains along the Caspian Sea to the Iranian plateau”. Azerbaijan is among the areas of earliest human settlement, with evidence of human habitation since the Palaeolithic age. Settlements engaging in agriculture and livestock-raising were widely distributed about this area in the seventh and sixth millennia BC. Rock paintings in Gobustan near are dated by scholars to the end of the seventh and beginning of the sixth millennia BC. The well-known Norwegian explorer Thor Heyerdal, who made special trips to in 1979 and 1994 to study these rock paintings, believes that the shores of the Caspian Sea were the cradle of a civilization that then spread over water, southward and northward. Heyerdal found support for his hypothesis not only in the Gobustan petroglyphs of reed boats, remarkably similar to those depicted centuries later by the Vikings on the walls of caves in Norway, but also in sagas written down in the middle ages. The Gobustan rock paintings of boats surmounted by an image of the sun also attest irrefutably to the ties between the early settlements of Azerbaijan and the Sumero/Akkadian civilization of Mesopotamia, whose cultural legacy includes very similar depictions. In the third millennium BC and the early years of the second millennium BC, signs appear of the emergence of the first class societies, with a proto-urban civilization and embryonic state structures. It is at this time that the tribal alliances were formed of the Aratta, the Gutians and the Lullubites. According to Sumerian cuneiform sources, the first State to arise on the territory of historical Azerbaijan was the state of Aratta, which came into being in the first half of the third millennium BC in the area to the south and south-east of Lake Urmia. From about 2300 BC, the second State of ancient Azerbaijan sprang up in the area south of Lake Urmia – the state of Lullubum. The Gutian state was formed later in the second half of the third millennium BC in the area west and south-west of Lake Urmia. In 2175 BC, the Gutians conquered Sumer and Akkad and ruled over them for the next 100 years. The ancient states of Azerbaijan, which maintained political, economic and cultural ties with Sumer and Akkad and formed part of the wider civilization of Mesopotamia, were governed by dynasties of Turkic descent. The Turkophone peoples that have inhabited the area of Azerbaijan since ancient times were fire-worshippers and adherents of one of the world’s oldest religions – Zoroastrianism. The country’s name, in its current form, is derived from a Turkic collocation meaning “land, noble people, and keepers of the flame”. Over the period from the late ninth to the seventh centuries BC, the Mannaean kingdom held sway in the area of Lake Urmia. The Cimmerian-Scythian-Saka kingdom flourished in the seventh and sixth centuries BC in the south-west of Azerbaijan. In the 670s BC, the Mannaean kingdom arose in the territory of Azerbaijan and was overthrown by the Persian Achaemenid kingdom in the mid-sixth century BC. A vital role was played in Azerbaijani history by the kingdom of Atropaten, which came into existence in the southern part of the country in the 520s BC and which was heavily influenced by Hellenism. The Caucasian Albanian state was created in the north of Azerbaijan in the third millennium BC, with the river Araz as its southern frontier. This state successfully held out against the constant aggression of Armenia, later to be destroyed by the Romans in 66 BC. The people of Albania included a number of different nationalities, most of which spoke Turkic languages. Christianity was adopted in Albania in 313 BC. 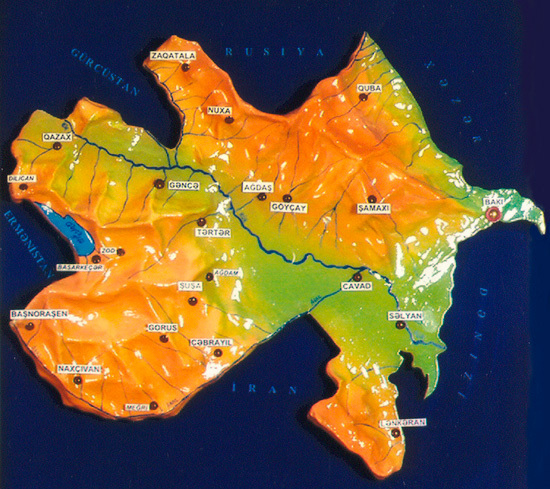 The territory of Albania also included the mountainous part of Karabagh, which was known at that time as Artsakh. Over the period from the first to the fourth centuries, when the entire Caucasus area was under the Roman yoke, Albania remained the only independent state and with its political independence came a flowering of Albanian learning, language and literature. This same period say the growing strength and influence of the autocephalous Albanian Catholicosate and of the Albanian Church in general, which was independent of other Christian churches and even propagated Christianity among the north Caucasian and Turkophone peoples. Following invasion by the Arabs, the dominant religion from the early eighth century in Azerbaijan became Islam. Most of the Albanians also converted to Islam and only a minority retained their former religion. Bowing to the influence of the Byzantine Empire in the southern Caucasus, the Albanian Church, together with the Georgian Church, had accepted the dyophysite doctrine shortly before the Arab invasion. To create a barrier to the influence of Byzantine, the Caliphate – enlisting the help of the Armenian Church – steered the Albanian Church towards monophysitism and brought it under the dominion of the monophysite Armenian Gregorian Church, opening the way for the subsequent gradual Gregorianization of the Albanians living in the mountainous areas of Karabagh – or Artsakh. The cohabitation of the populations of Albania and Atropatene within the confines of a single state, and their profession of one and the same religion, helped ensure the consolidation of the people of Azerbaijan. The notions of freedom, independence and universal equality nurtured the Hurramite movement, led by Babak, which flourished in Azerbaijan in the early ninth century. Following the anti-Caliphate rising by the local population, several new states arose in the territory of Azerbaijan in the ninth century, the most powerful of which was the State of Shirvan, with its capital at Shemakha, which was ruled by the Shirvanshah dynasty. This endured until the sixteenth century and played an enormous role in the history of medieval Azerbaijan. The independent states of the Sajids, Salarids, Ravvadids (with their capital at Tabriz) and Shaddadids (with their capital at Ganja) arose from the ninth to the eleventh centuries in the territory of Azerbaijan. Azerbaijan was ruled by the Seljuk dynasty from the end of the eleventh century. Over the period 1136-1225, the Atabek Eldegiz state held sway in Azerbaijan. The sharing by the country’s indigenous population of a common Turkic language and Turkic provenance and their adherence to the same Islamic faith made possible a process of consolidation of the Azerbaijani nation that reached its culmination in the eleventh and twelfth centuries. This same period saw the greatest flowering of the culture of Azerbaijan, which bequeathed to the world an array of illustrious philosophers, architects, poets and scholars. The crowning achievement of Azerbaijani social and cultural thought of that period was the work of Nizami Ganjavi (1141-1209), poet and philosopher, now one of the treasures of the world’s cultural heritage. The twelfth and thirteenth centuries saw the rise to prominence, in the mountainous regions of Karabagh, of the Khachen principality, ruled by the Albanian kings. The rule of Hasan Jalal (1215-1262) ushered in an Albanian renaissance and saw the completion of the construction of Gandzasar monastery complex, whose cathedral was to become the centre of the early church and whose consecration was presided over by the Catholicos of Albania. From the mid-thirteenth century, the Azerbaijani states became vassals of the Mongol Hulagid dynasty (1258-1356). In the mid-fourteenth century, following an uprising by the local population to cast off the yoke of the invaders, the local Jalairid feudal lords took up the reins of power and, with the support of the Azerbaijani nobility, established the Jalairid state (1359-1410). From the end of the fourteenth century, Azerbaijan was repeatedly invaded by Tamerlan and served as the theater for his battles with the Golden Horde. The Azerbaijani dynasties of Qara-Qoyunlu and Aq-Qoyunlu ruled over Azerbaijan in 1410-1468 and 1468-1501 and under them Azerbaijan grew significantly in power. In 1501, the Safavid state was formed in Azerbaijan, which was named after the ruling Azerbaijani dynasty, with its capital in Tabriz. Under this dynasty, all the lands of Azerbaijan were united, for the first time in their history, into a single Azerbaijani state. The territory of the Safavid state stretched from the Amu Darya River to the Euphrates and from Derbent to the shores of the Persian Gulf. This polity was created and developed as an essentially Azerbaijani state and all political power remained in the hands of the Azerbaijani feudal nobility. Senior court officials, military generals and provincial governors were all appointed from among the Azerbaijani nobility. The army was made up from the militia of the most powerful Azerbaijani clans. Azerbaijani was the official language of the Safavid state. By the end of the sixteenth century, the capital of the Safavid state had been transferred to Isfahan and its shah now drew his support primarily from the Persian nobility. The State, while ruled by an Azerbaijan dynasty, took on an increasingly Persian aspect. The independent Azerbaijani khanate States. In the 1740s, with the weakening of the power exercised by the Persian shahs over the territory of Azerbaijan, the country disintegrated into some 20 khanates, namely, Ardabil, Ganja, Derbent, Erivan, Javad, Karabagh, Karadagh, Khoi, Maku, Maragin, Nakhichevan, Quba, Salyan, Sarab, Shirvan, Sheki, Tabriz, Talysh and Urumi. In addition to these khanates, the country was further subdivided into the sultanates of Kazah-Samshadil, Borchala, Ilisu, Araxes, Gutgashen and Gabala. Upper Karabagh, which was inhabited by Azerbaijani Muslims and Albanian Christians, formed an integral part of the Azerbaijani khanate of Karabagh, which covered the territories lying between the Kura and Araxes rivers. The local duchies – or “melikdoms” – of Dizak, Varanda, Khachen, Jeraberd and Gulistan, all of which lay within the mountainous regions of Karabagh, also formed part of this khanate, to which their inhabitants owed allegiance as vassals. At the end of the eighteenth and in the first third of the nineteenth centuries, Azerbaijan was fought over by the Persian, Russian and Ottoman empires, each eager to secure hegemony over this country whose geopolitical situation lent it significant strategic advantages. A number of the khanates rose in arms to defend their sovereignty, while others were forced, in an effort to defend their own interests, to conclude agreements reducing them to the status of vassaldom. Thus, on May 14, 1805, a treaty was signed on the banks of the river Kura with the Azerbaijani khan Ibrahim Khalil, under which the independent Azerbaijani khanate of Karabagh was placed under Russian overlordship. This treaty has particular resonance today, since it demonstrates that Karabagh historically formed part of Azerbaijan. The first Russo-Persian war of 1804-1813, fought to establish dominance over the Azerbaijani khanates, resulted in the first division of Azerbaijani territories between Russia and Persia. The peace treaty of Gulistan, signed on October 12, 1813 by Russia and Persia, gave legal recognition to the effective annexation by Russia of the khanates of northern Azerbaijan, with the exception of Nakhichevan and Erivan. The second Russo-Persian war of 1826-1828 led, on February 10, 1828, to the signing of the Turkmanchai peace treaty, under which Persia officially renounced its claims to northern Azerbaijan and finally recognized its annexation, with the inclusion of the Nakhichevan and Erivan khanates, by Russia. It is important to stress that all the khanates listed above, including Karabagh, were annexed to Russia as purely Azerbaijani possessions. They were Azerbaijani by virtue of their predominantly Azerbaijani populations and the ethnic composition of their dominant feudal elite (the khans themselves, the major landowners, the clergy etc.). Under the Treaty of Turkmanchai and the peace treaty concluded in Edirne in 1829, the Armenians then inhabiting Persia and the Ottoman Empire were relocated to Azerbaijan, primarily to the khanates of Nakhichevan, Erivan and Karabagh. Thus, the Russian scholar K. Shavrov records that, over the period 1828-1830 alone, some 40,000 Persian and 84,000 Turkish Armenians were relocated in the Trans-Caucasus, where they were settled in the best indigenous lands of the Yelisavetpol (Karabagh) and Erivan provinces, where the Armenian population had previously been negligible and where they were allocated 200,000 dessiatines (225,000 hectares) of State land. The American academician Justin McCarthy adduces the following facts on the settlement of the Southern Caucasus and, in particular, Azerbaijan, by Armenians. Between 1828 and 1920, in pursuance of a policy aimed at changing the entire demographic make-up of Azerbaijan so that Armenians would outnumber Azerbaijanis, more than 2 million Muslims were forcibly expelled and an unknown number killed. On two occasions, in 1828 and 1854, the Russians invaded eastern Anatolia and on both occasions they left, taking with them 100,000 Armenian sympathizers to the Caucasus, where they took the place of Turks – i.e. Azerbaijanis – who emigrated or died. In the war of 1877-1878, Russia seized the district of Kars-Ardahan, driving out the Muslim population and settling 70,000 Armenians in their homes. Some 60,000 Armenians resettled in the Russian Caucasus during the troubles of 1895-1896. Finally, the migrations of the First World War resulted in an almost even exchange of 400,000 Armenians from eastern Anatolia for 400,000 Muslims from the Caucasus. According to McCarthy’s information, between 1828 and 1920 some 560,000 Armenians were resettled in Azerbaijan. In other words, it was actually after the conquest of the southern Caucasus by Russia that the Armenian population of the Azerbaijani lands north of the river Araxes increased so dramatically. When we look at Karabagh, we see from official records for 1810 – in other words, shortly before its annexation by Russia – that the khanate of Karabagh had some 12,000 households, of which 9,500 were Azerbaijani and a mere 2,500 Armenian. According to data for 1823, there was one town in the Karabagh khanate – Shusha – and some 600 villages, 450 of which were Azerbaijani and about 150 Armenian, with a total population of some 90,000. The relative figures for Azerbaijani and Armenian households in Shusha were 1,048 and 474, and in the countryside, 12,902 and 4,331, respectively. Under a decree promulgated by Tsar Nicholas I on March 21, 1828, the Azerbaijani khanates of Nakhichevan and Erivan were dissolved and replaced by a new administrative entity known as the “Armenian oblast”, administered by Russian officials; in 1849, the Armenian oblast was renamed the province (“guberniya”) of Erivan. In pursuit of their ultimate goals, the Armenians persuaded the Russian authorities to abolish the Albanian Christian patriarchate, which had been in operation in Azerbaijan, and to transfer its property to the Armenian Church. Following the loss of their state sovereignty and distinct confessional identity, the local Albanian population in the western regions of the former Albania – the Karabagh region – into which Armenian settlers continued to pour, gradually started to undergo a process of Gregorianization, or Armenianization. Since the mid-19th century, the oil industry had been flourishing in northern Azerbaijan. The first ever industrial oil well was drilled in 1848. In the late 19th-early 20th centuries was producing 95% of Russia’s and about 50% of the world’s oil production. The Nobels and Rothschilds were among the oil magnates of , and earned a considerable income. The fortune of the Nobels was largely derived from the profit on Azerbaijani oil. The second half of the 19th – early 20th century was also a progressive period for the national culture of Azerbaijan. In 1907, Uzeyir Hajibayov, famous Azerbaijani composer, wrote his “Leyli and Majnun”, the first opera in the Muslim world. In general, the country’s musical culture was so highly developed that Azerbaijan was known as the ”East’s Conservatoire” or the ”East’s Italy”. A national social and cultural awakening was to be found in other spheres too. From the mid-19th century the concept of mass enlightenment actively spread and, to that end, the “Azerbaijan” newspaper was published through the efforts of Azerbaijani intelligentsia in 1858 in Tabriz, southern Azerbaijan. It was the first newspaper in Azerbaijani language and was published under different names over several years. In North Azerbaijan, between 1875 -1877, the newspaper “Akinchi” (Ploughman) was published under the guidance of the visionary Hasan bay Zardabi. One of the main achievements of “Akinchi” was to lead the challenge of enriching the native language and to broaden its usage. At the same time, a number of prominent literary figures emerged to provide further impetus to the nation’s cultural development: Mirza Fatali Akhundov, Mirza Alakbar Sabir, Jalil Mammadguluzadah, Jafar Jabbarli, Firudun bay Kocharli, Ahmad Javad, are some that deserve special mention. Similar progress was made at that time in the spheres of fine arts, architecture, the theater and cinematography. This rapid cultural-ideological movement also made a great influence on political institutionalization and consolidation of Azerbaijani society. Azerbaijanis living within Russia were among the pioneers of the Empire Muslims’ democratic movement for the protection of rights. Alimardan bay Topchubashov, a distinguished Azerbaijani statesman, became one of the founders of “Ittifaqi Muslimin” (Union of Muslims). It was established in 1905 in order to represent and pursue the Turkic-Muslim peoples’ interests with the Empire’s authorities. In general, the Azerbaijani representatives took an active part in this movement, striving for the common aims of oppressed Muslims in Czarist Russia. When considering progress in the sphere of political consciousness in the early 20th century, it would be wrong not to highlight the vision of pan-Turkist Ahmad bay Agaoglu, and Ali bay Huseynzadeh, who shaped the idea of Azerbaijanism, consolidating the nation at a moral level, as a synthesis of traditional Islamic and Turkic priorities with those of the modern era. The period from the late 19th century throughout the first half of the 20th century also witnessed activation of the political consciousness of Azerbaijanis living in Southern Azerbaijan. Movements of 1905-1911 for the limitation of Shah’s absolutism – headed by such Azerbaijani national heroes as Sattar khan and Baghir khan – for the first time brought the democratic forms of political culture and institutionalization to Persia, then under the rule of the Gajar dynasty. One direct consequence of the 1905-1911 socio-political developments was the establishment of a movement in Tabriz in 1919 under the guidance of Sheikh Khiyabani. Later, the establishment of a parliament and government in Southern Azerbaijan in 1945 indicates the significant rise of political culture of Azerbaijanis living in the Shah’s Iran. Indeed, South Azerbaijan became the heart of all democratic processes in Iran during the late 19th century and the first half of the 20th century. After the 1917 revolution in Russia, the processes of weakening and disintegration of the Empire became more pronounced and conditions were ripe in outlying ethnic regions of the former Russian Empire for the formation of independent States. And so, on May 28, 1918 the Azerbaijani Democratic Republic was proclaimed in the territory of the eastern part of the southern Caucasus – the first parliamentary democracy in the Islamic east – and which was to play a historic role in the renaissance and formation of the sense of ethnic identity and statehood of the Azerbaijani nation. The development of the Azerbaijani Democratic Republic, both as a nation and a State, was based on the doctrine of “Azerbaijanism”, which hinged on the principles of modernism, Islamism and Turanism, symbolizing the Azerbaijani people’s aspiration for progress based on preservation of their adherence to Islamic civilization and Turkic culture and on their separate ethnic identity. In its brief existence of less than two years, the multi-party Azerbaijani parliament and the coalition government managed to take a number of important steps in the process of nation-building and the development of statehood, in such areas as education, formation of an army, development of independent financial and economic systems and securing international recognition for the young republic as a full member of the international community of nations. On January 11, 1920 the Paris Peace Conference, with the Treaty of Versailles, accorded de facto recognition of the independence of the Azerbaijani Republic, with its capital – . In late 1919 and early 1920, however, the political situation of the Azerbaijani Democratic Republic – both at home and abroad – worsened considerably. The country found itself caught up in a ferocious tug-of-war between the countries of the Entente, Turkey, Russia and Persia, each pursuing its own geopolitical goals in this strategically important and oil-rich area. The National Council of Azerbaijan, consisting of the Deputy Chairman Hasan-bey Agayev, the Secretary Mustafa Mahmudov, Fatali Khan Khoyski, Khalil-bey Khas-Mammadov, Nasib-bey Usubbeyov, Mir Hidayat Seidov, Nariman-bey Narimanbeyov, Heybat-Gulu Mammadbeyov, Mehti-bey Hajinski, Ali Asker-bey Mahmudbeyov, Aslan-bey Gardashev, Sultan Majid Ganizadeh, Akber-Aga Sheykh-Ul-Islamov, Mehdi-bey Hajibababeyov, Mammad Yusif Jafarov, Khudadad-bey Melik-Aslanov, Rahim-bey Vekilov, Hamid-bey Shahtahtinskiy, Fridun-bey Kocharlinski, Jamo-bey Hajinski, Shafi-bey Rustambeyov, Hosrov-Pashabey Sultanov, Jafar Akhundov, Mahammad Maherramov, Javad Melik-Yeganov and Haji Molla Akhund-zadeh adopts the following Act of Independence of Azerbaijan on May 28, 1918 in the city of Tiflis. The political regime established in Russia during the Great Russian Revolution has caused the collapse of the different parts of the state structure and the abandonment of Transcaucasus by the Russian troops. Left on their own, the Transcaucasian peoples took over the decision on their fate and established the Transcaucasian Democratic Federal Republic. However, in the subsequent political development, the Georgian people expressed their will to separate from the Transcaucasian Democratic Federal Republic and to create the Independent Georgian Democratic Republic. Generated by the cessation of hostilities between Russia and the Ottoman Empire, the current political situation of Azerbaijan and in particular the intolerable anarchy within the country, call for the need of creating a separate State in Azerbaijan in order to deliver its people from the constraints that result from the present difficult internal and external situation. This State shall consist of Eastern and Southern Transcaucasus. I. Henceforth, the people of Azerbaijan is sovereign and Azerbaijan, consisting of Eastern and Southern Transcaucasus, is an independent state with all rights pertaining to statehood. II. The form of political organization of independent Azerbaijan is a Democratic Republic. III. The Democratic Republic of Azerbaijan aims to establish relations of good neighbourhood with all countries, in particular with friendly nations and states. IV. The Democratic Republic of Azerbaijan guarantees on its territory, the civil and political rights to all citizens, irrespective of their nationality, religion, social status and gender. V. The Democratic Republic of Azerbaijan provides widest possibilities to all ethnic groups living on its territory, for their free development. VI. Pending the first session of the Constitutive Assembly, governmental authority in Azerbaijan is entrusted to the Provisional Government, which reports to both the National Council and the National Assembly, issued from a nation-wide election. The political decision by the Bolshevist Government of the Russian Socialist Federative Republic (RSFSR) not to recognize the Azerbaijani Democratic Republic, the deployment of the Eleventh Red Army on the frontiers of the Azerbaijani Republic in Spring 1920, the aggression waged by Dashnak-ruled Armenia against Azerbaijan in Karabagh and Zangezur, terrorist strikes by Armenian groups and the Bolsheviks against the peaceful Azerbaijani population inside Azerbaijan and the social and economic crisis gripping the country – were all factors that combined to bring about a weakening of the Azerbaijani Democratic Republic and which led to the occupation of its capital by the Eleventh Army on April 27-28, 1920. As stated in a telegram from the general staff of the Caucasian front to the Eleventh Army command, dated May 1, 1920, the RSFSR troops had been instructed to take possession of the entire territory of Azerbaijan lying within the confines of the former Russian Empire, but without crossing the Persian border. The next 70 years, during which it formed part of the Union of Soviet Socialist Republics (USSR), marked a new, important stage in the development of the Azerbaijani statehood, during which the Azerbaijan Soviet Socialist Republic forged ahead in its social, economic and cultural development. At the same time, however, the Soviet period also saw many negative trends emerge in Azerbaijan, as elsewhere throughout the USSR. At the economic level, the country became a reservoir of fuel, raw materials and agricultural produce for the Soviet economy. At the cultural level, the imposition of the Cyrillic alphabet in place of the Latin alphabet severed the country’s ties with the fountainhead of Azerbaijani literature and culture. The Soviet regime was at pains to suppress any efforts by the Azerbaijani intelligentsia to manifest their separate ethnic identity and to study the true history of their country. During the Soviet period, the territories of Zangezur, Gekcha, part of Nakhchivan and other districts were hived off from Azerbaijan and attached to neighbouring Armenia. As a result, the country’s area, which in the period of the Azerbaijani Democratic Republic in 1920 was 114,000 square kilometres, was reduced in 1920-1921 to 86,600 square kilometres. In addition, on July 7, 1923 at the initiative of the Moscow leaders of the Bolshevists, the so-called Nagorno-Karabakh autonomous region, with a predominantly Armenian population, was artificially carved out of a part of the territory of historical Karabagh, the majority of population of which constituted Azerbaijanis. That decision marked the first step in the political campaign to amputate Nagorno-Karabakh from the rest of Azerbaijan. In 1988-1990, the national democratic movement in Azerbaijan campaigned vigorously for the restoration of the country’s independence. On September 23, 1989 Azerbaijan was among the first Soviet republics to adopt its own Constitutional Law on Sovereignty. With a view to suppressing this movement, on January 20, 1990, with the approval of the Soviet leadership under Mikhail Gorbachev, Soviet army units were dispatched to . Their reprisals, which were conducted with uncommon savagery, left hundreds of innocent Azerbaijani citizens dead and wounded. A state of emergency was declared in the country and this remained in force until mid-1991. Notwithstanding these setbacks, the untiring struggle for independence by patriotic forces within the Azerbaijani people culminated in the adoption of a declaration of the Supreme Council of the Republic of Azerbaijan on August 31, 1991 on restoration of the State independence of the Republic of Azerbaijan. The act establishing the State independence of the Republic of Azerbaijan, which completed its passage on October 18, 1991, set out the foundations for the statehood of an independent Azerbaijan and determined the principles of its political and economic structure. With that act the Republic of Azerbaijan once again, after an interval of 71 years, became an independent subject of international law. In 1992 Azerbaijan became a member of the United Nations and the Conference for Security and Cooperation in Europe (CSCE), now known as the Organization for Security and Cooperation in Europe (OSCE).